I’m really excited, since I’m leaving on vacation tomorrow! I’m going on a cruise to the Bahamas, and I’m excited to do a little relaxing and sunbathing. Unfortunately, this means I won’t have access to a computer for a while, and won’t be able to continually update my blog on a daily basis like I usually would. But don’t worry! As soon as I return from the trip, a normal posting schedule will resume, and I’ll have lots more polishes to share with you! In the meantime, I’d love to hear your feedback. What do you guys like about my blog, and what do you think I could do better? Also, what kinds of posts would you like to see in the future? Thank you for all of your support, and I’ll talk to you all when I get back! Categories: Uncategorized | Tags: break, hiatus, update | Permalink. 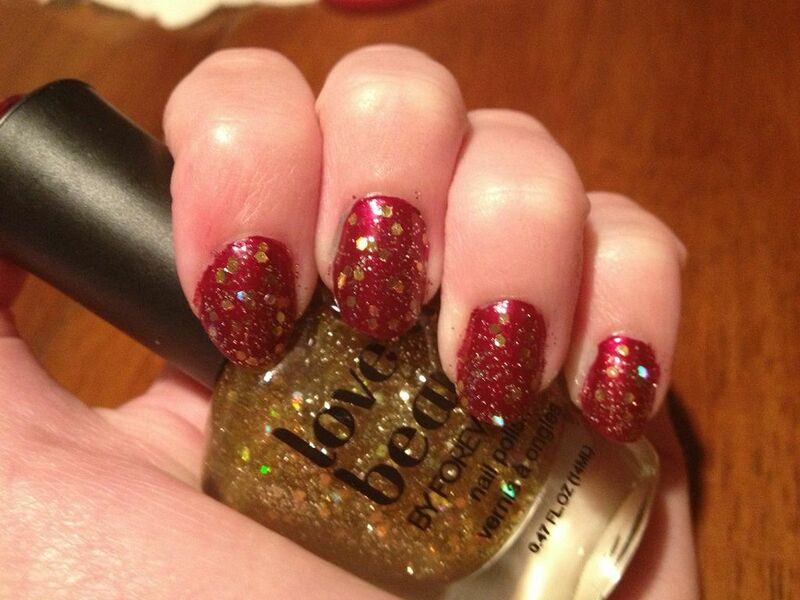 Categories: Love and Beauty, ULTA | Tags: chinese, Forever 21, glitter, gold, Love and Beauty, MOTD, red, Ulta | Permalink. 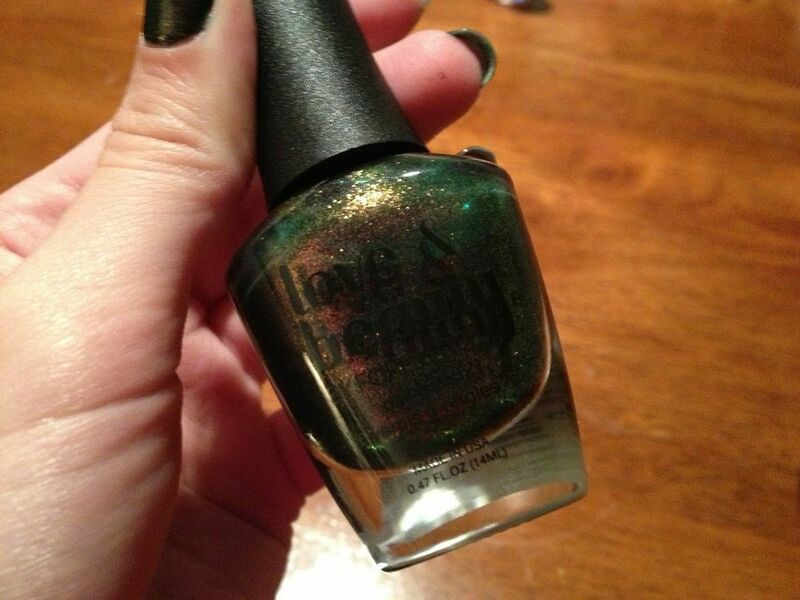 Categories: Love and Beauty | Tags: duochrome, emerald, Forever 21, Love and Beauty, MOTD, shimmer, Versace | Permalink. So today’s post is gonna be realllllllyyyyy quick, because I’m dead tired. 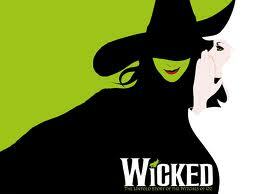 I just got back from a day trip with my mom; we went to the Big Apple to see Wicked on Broadway! If you haven’t been before, I’d highly recommend you do if you have the chance, the show was fantastic! The singing was phenomenal and the sets and costumes and special effects were also amazing. The only flaw? The Gershwin Theater is freezing cold! It was 90 degrees outside and we were all bundled up in our sweaters trying our best to stay warm! Walking out into the stifling heat after the show ended never felt so good! 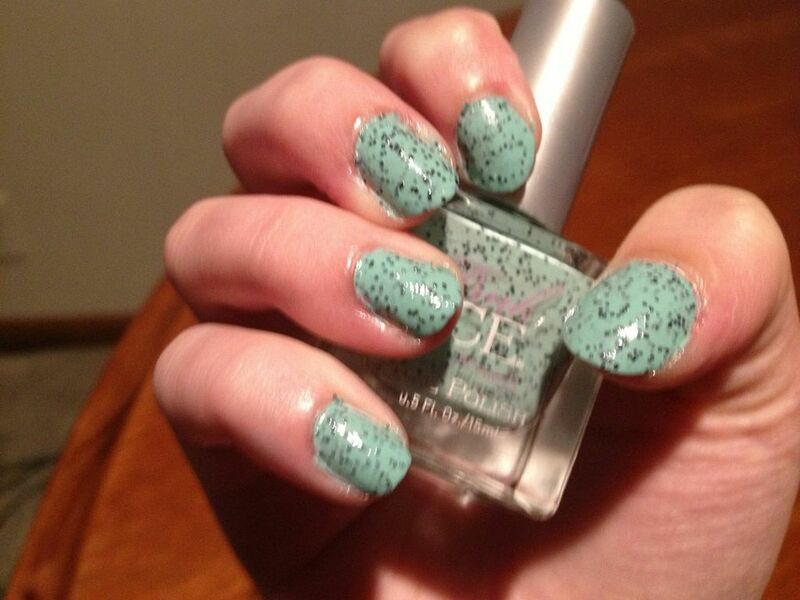 Below are the pictures, with one coat of Sally Hansen Diamond Strength Nail Color in “Flawless” as my top and base coat. Indoor, artificial lighting. Sorry for how messy the cuticles are, when I took these pictures, I was in a hurry since I was packing my purse for my trip the next day! 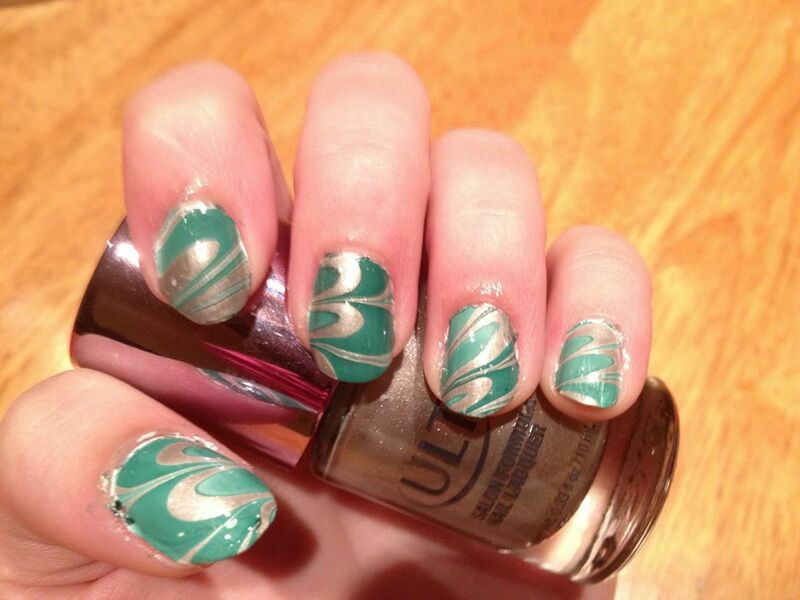 I hope you all aren’t getting too tired of water marbling. I’ll try and post other things in the next coming days. 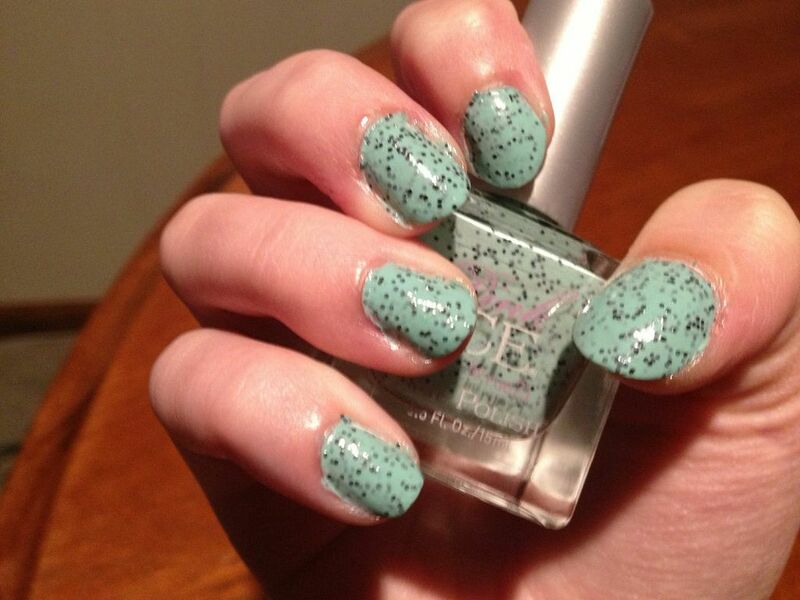 I bought 3 polishes in NYC, and I’m going back Saturday, so I might even get more still! 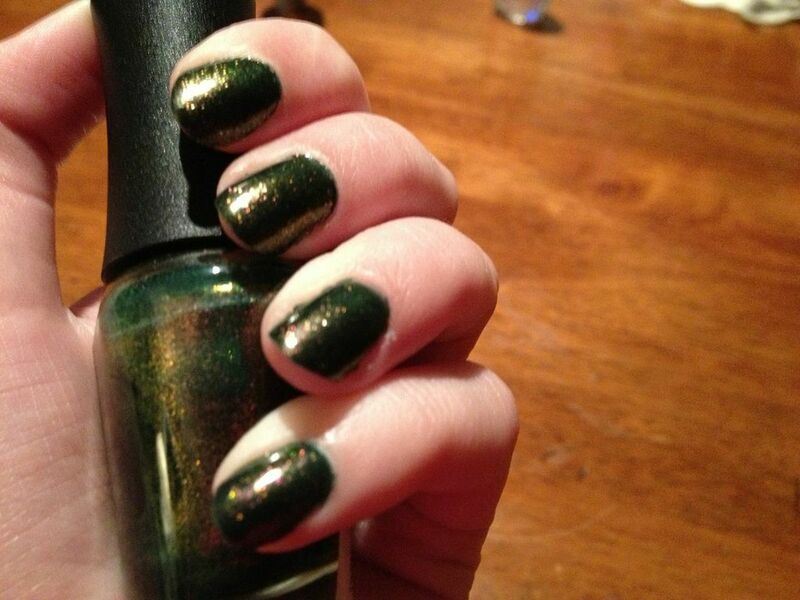 What are your thoughts on this Wicked-inspired manicure? What’s your favorite Broadway show? 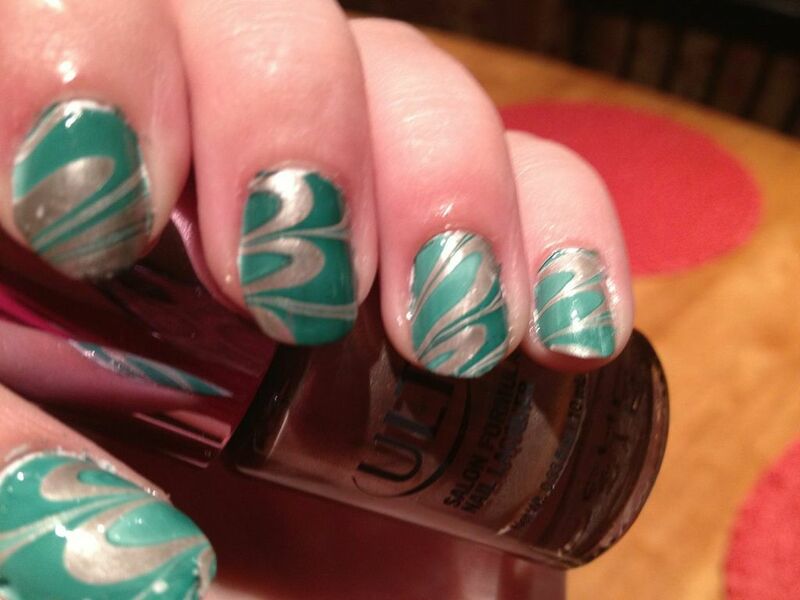 Categories: Nail Art, Uncategorized, Water Marble | Tags: Broadway, green, nail art, NYC, Rue Beauté, Ulta, water marble, Wicked | Permalink. Categories: Nail Art, Uncategorized, Water Marble | Tags: bright, Mom, nail art, Rue Beauté, Sinful Colors, summer, Ulta, water marble, Wet N' Wild | Permalink. 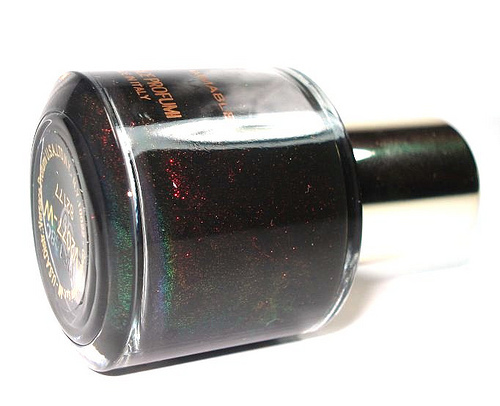 Categories: Pink Ice | Tags: black, Deborah Lippman, glitter, mint, MOTD, nail polish, Pink Ice, review | Permalink. 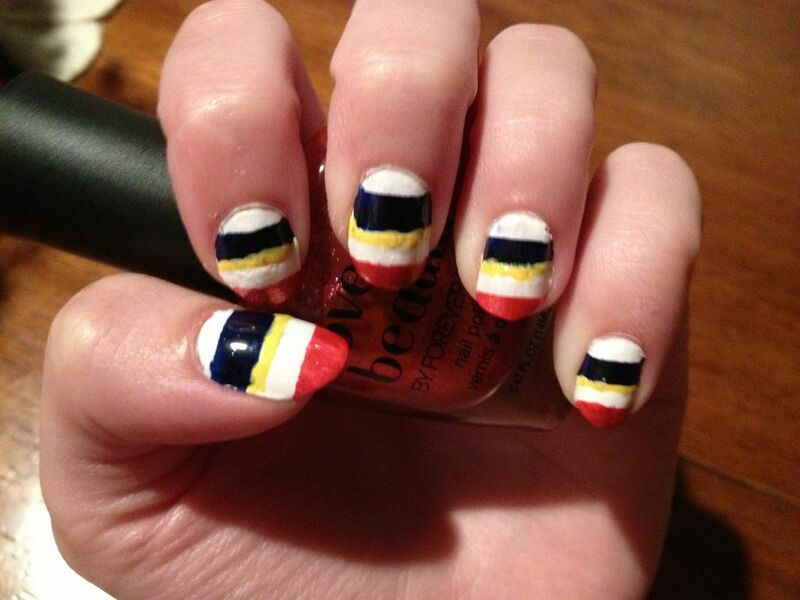 Today I have for you a fun, bold nail art design that’s easy to create and is sure to garner you a ton of compliments! I wore it out to the mall today, and every cashier I talked to said that they loved it, it felt great! 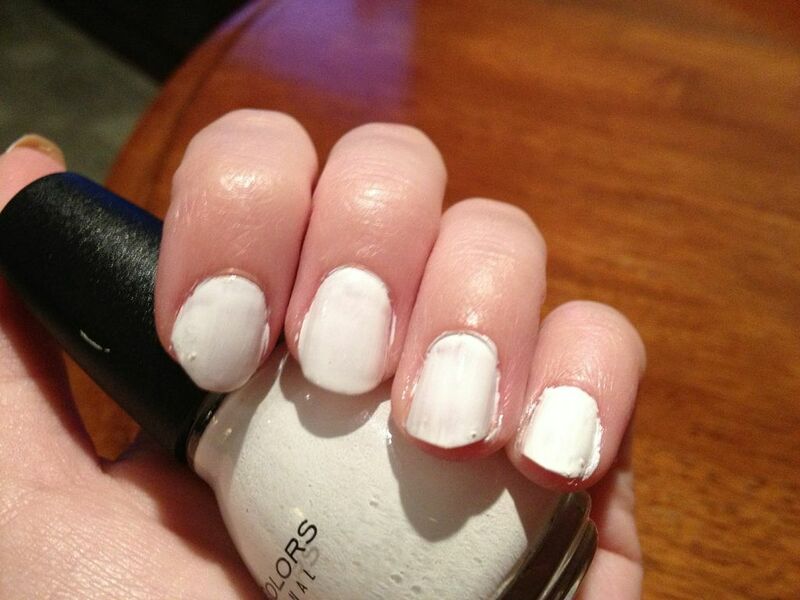 To create this look, I started with a base coat of Sally Hansen Diamond Strength Nail Color in “Flawless”, and then painted on one coat of Sinful Colors “Snow Me White” (reviewed yesterday). I let the white dry COMPLETELY (about 15 minutes) before moving on. I took regular scotch tape pieces long enough to stretch horizontally across my nail, and pressed them into my skin and peeled them off a few times to reduce the stickiness, so that they wouldn’t pull up nail polish. 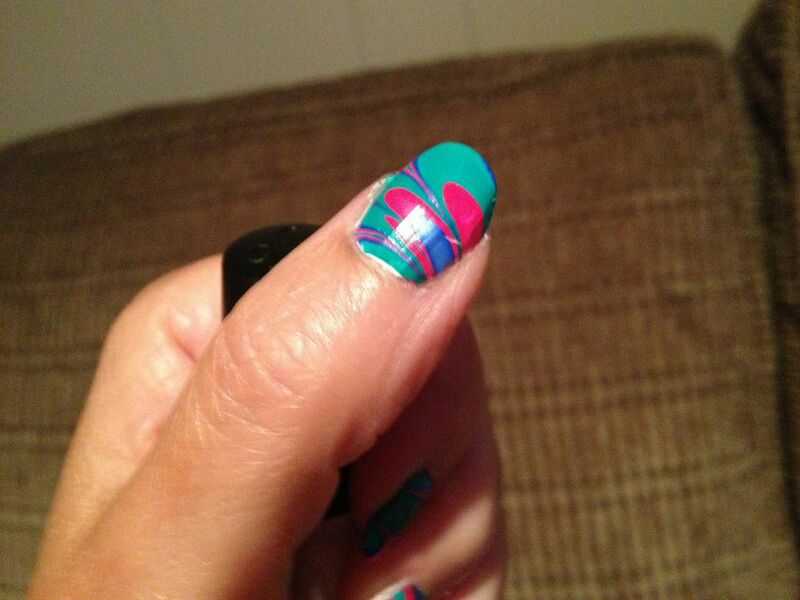 I then used different patterns of the tape to create different sized stripes for each color. The tape ensures that the lines are nice and crisp. As soon as you paint on the next layer of color, peel off the tape. 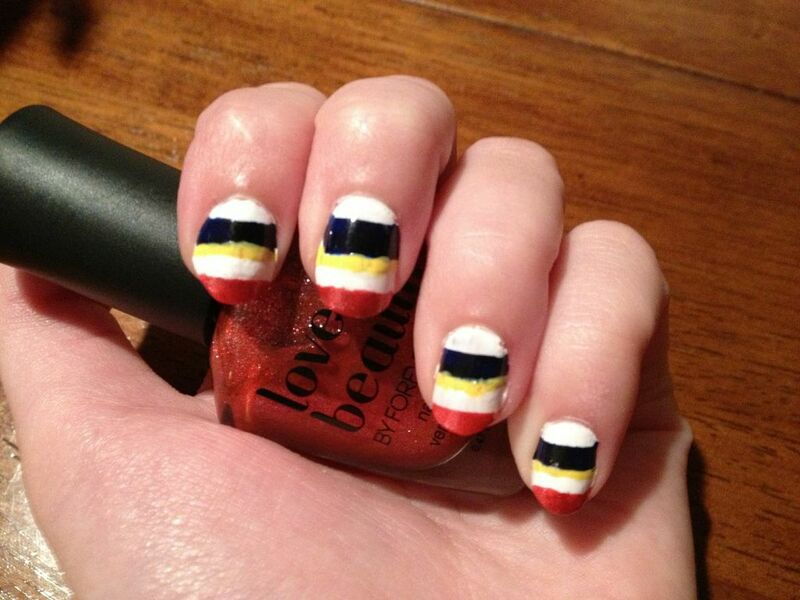 If you let the polish dry first, you won’t get as sharp of a line. If you have little mistakes in the line, just go over it later in the color you want it to be. Repeat until the design matches mine, or until you like it. Feel free to swap out colors! I didn’t have a camera available to me while I was doing the design, so I don’t have pictures of me creating it. 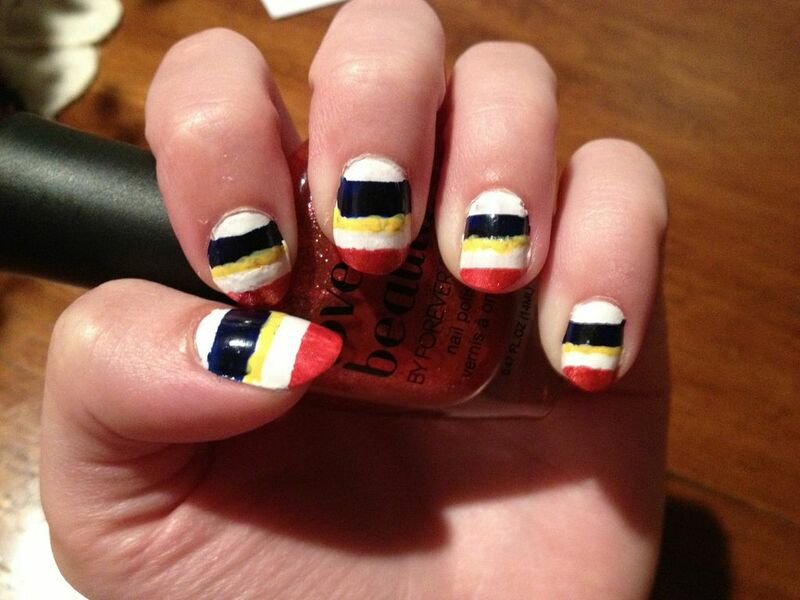 However, I highly doubt this will be my last “tape” manicure, so I’ll be sure to show pictures next time! Below are pictures indoors, artificial lighting, with one topcoat of Sally Hansen Diamond Strength Nail Color in “Flawless” as a top coat. 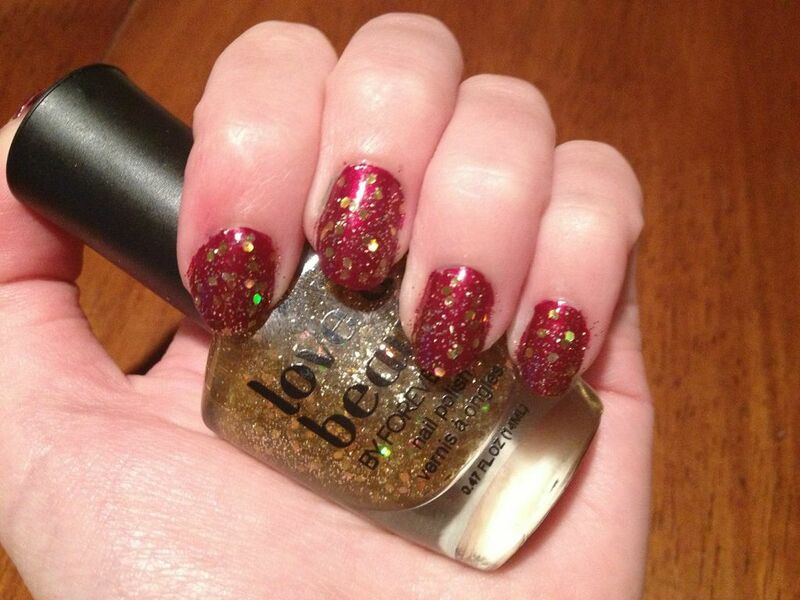 So what do you think of this fun, wearable nail art? Simple enough for you, or too loud and crazy? What’s your favorite summer nail look? Keep checking my blog this week, I have lots more nail art and water marble looks to show you, including guest hand models including one of my best friends, Tory, and my Mom! 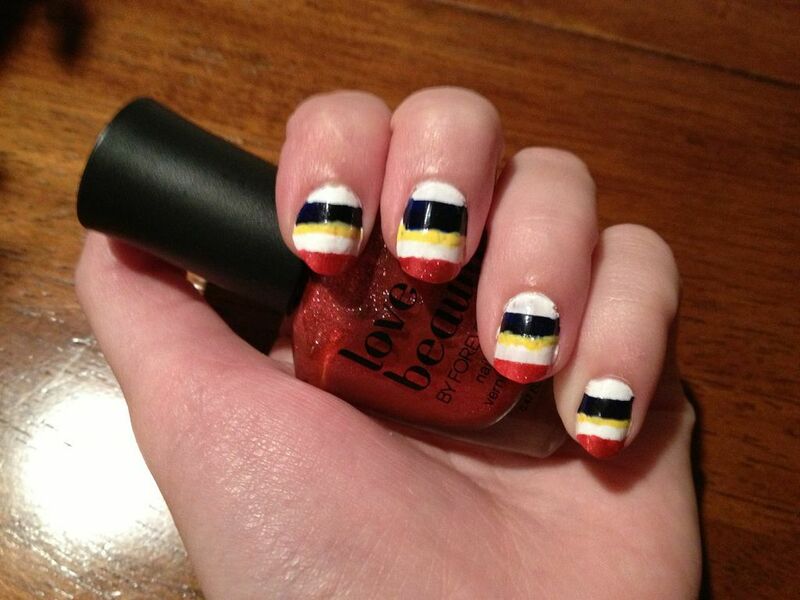 Categories: Nail Art, Uncategorized | Tags: Love and Beauty, nail art, nautical, Rue Beauté, Sally Hansen, stripes, tape | Permalink. 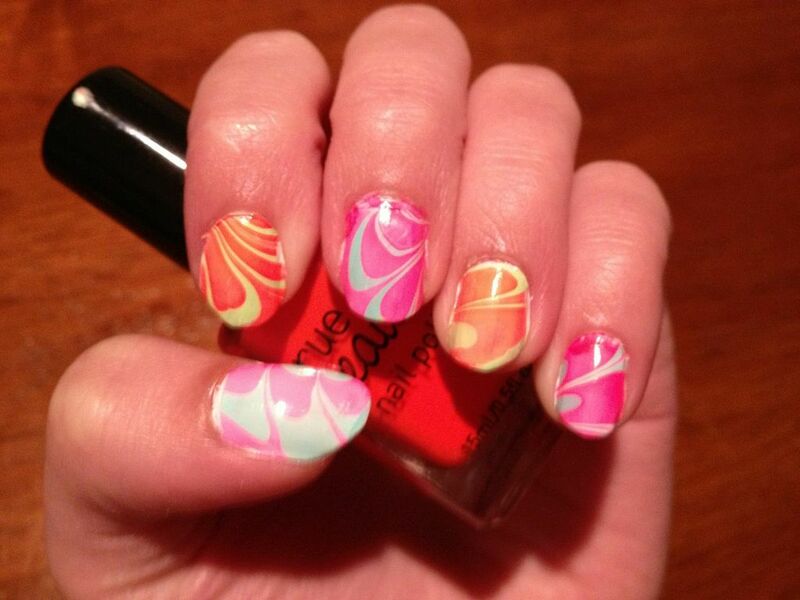 Today I have a bit of a “filler” post for you, because I have an awesome nail art design to show you tomorrow! (it’s not quite finished yet though, I just got too tired to keep going, lol). 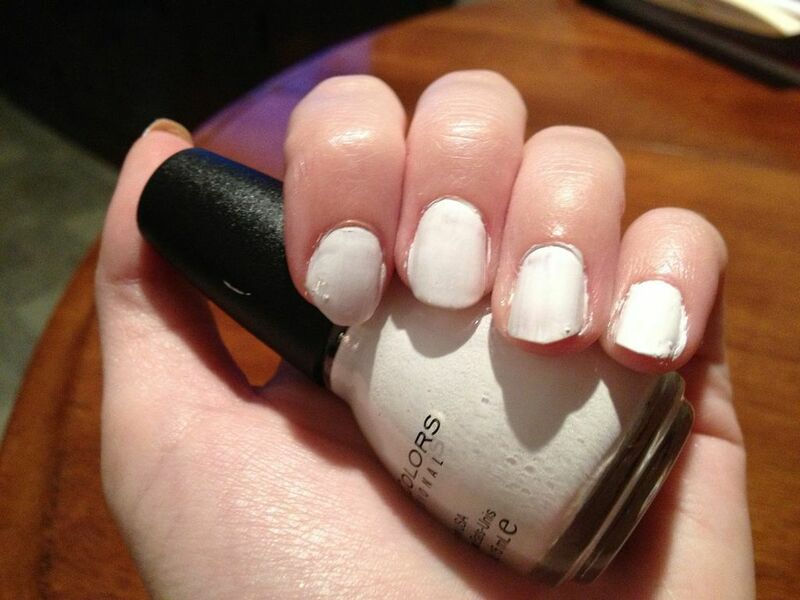 Today I have for you Sinful Colors “Snow Me White”, my favorite white polish of the moment! I like how it gives excellent coverage in just one coat (!!!) and isn’t as streaky as some of the others I have tried. It’s still on the thick side, but it’s not unmanageable. I realize brands like OPI or China Glaze or Zoya might have better formulas than the $1.99 Sinful Colors, but at a price under $2, I’m willing to deal with slight imperfections. These pictures below are indoors, and are just one coat, no top coat, with Sally Hansen Diamond Strength Nail Color in “Flawless” as a base. Sorry for the messy cuticles, I was in a bit of a rush. What do you think of “Snow me White”? 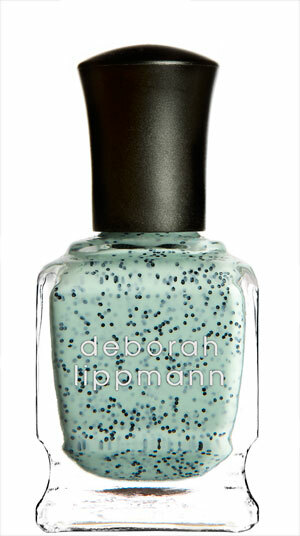 What’s your favorite white polish? Categories: Uncategorized | Tags: favorites, nail polish, Sinful Colors, white | Permalink. 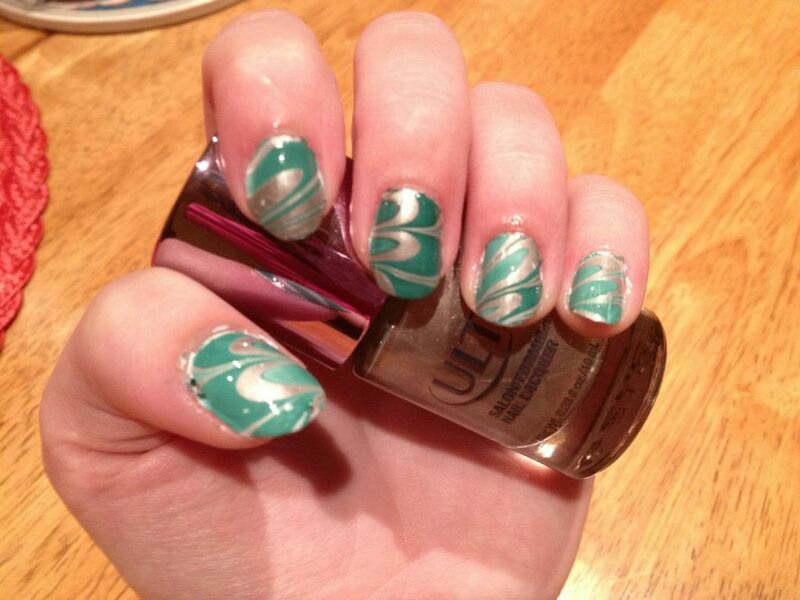 So yesterday’s “flashback” post inspired me to try some water marble nail art again. I hadn’t done it in about a year (school has been crazy with AP’s and extracurriculars!) so I had to get the hang of it again. And let me tell you, I made a hugeee mess in the process! To add to the length of time it took to (finally!!!) get it right, I completely botched the white nail polish (that I use as a base for the design) on my entire left hand and had to stop, remove it, and start over again. I’m really such a klutz sometimes! In the end though, I’m satisfied with the results. Below are pictures of the final result. The white polish I used as a base was Ulta Salon Formula Nail Laquer in “Snow White”, and the base and top coat are, as always, Sally Hansen Diamond Strength nail polish in “Flawless”. I apologize for the pictures for this one, it was picking up the orange all kinds of wrong. In these pictures, it looks like an orange-y red or a dark peach, when in reality it’s a real in-your-face neon orange. All these colors are much more eye-searing in person. 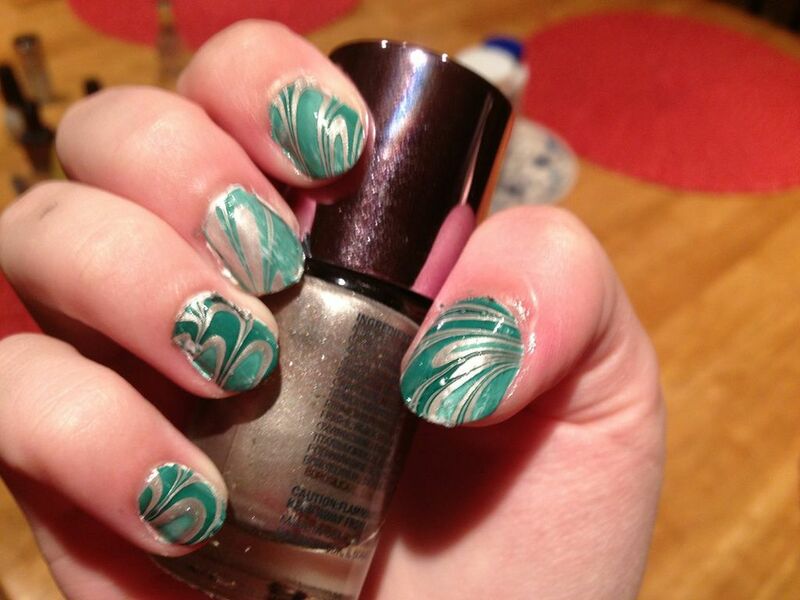 So what do you think of my latest water-marble creation? 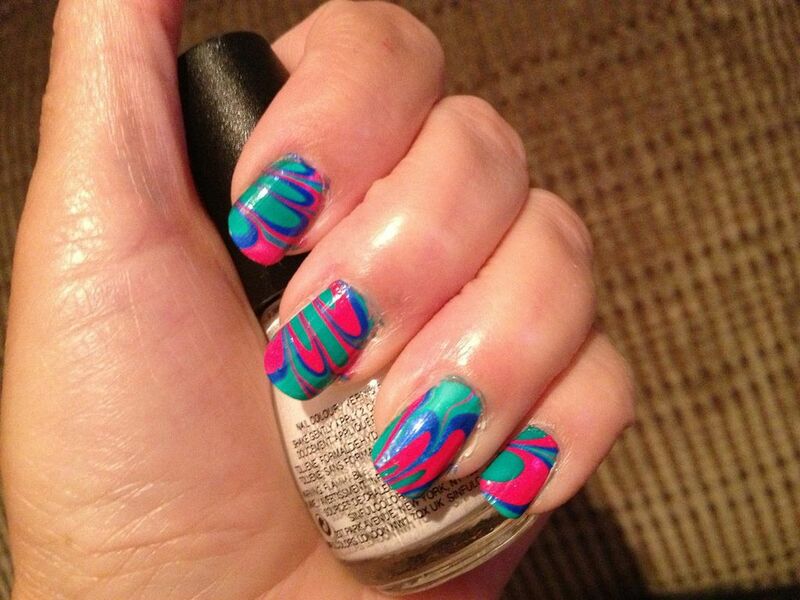 Are you a fan of summer neons? 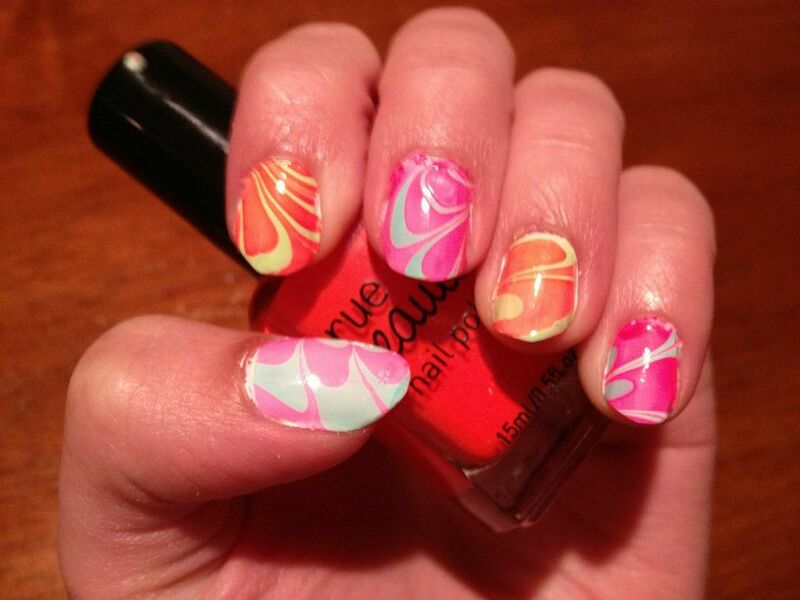 Categories: Nail Art, Water Marble | Tags: dELIA's, nail art, nail polish, neon, Rue Beauté, Ulta, water marble | Permalink. 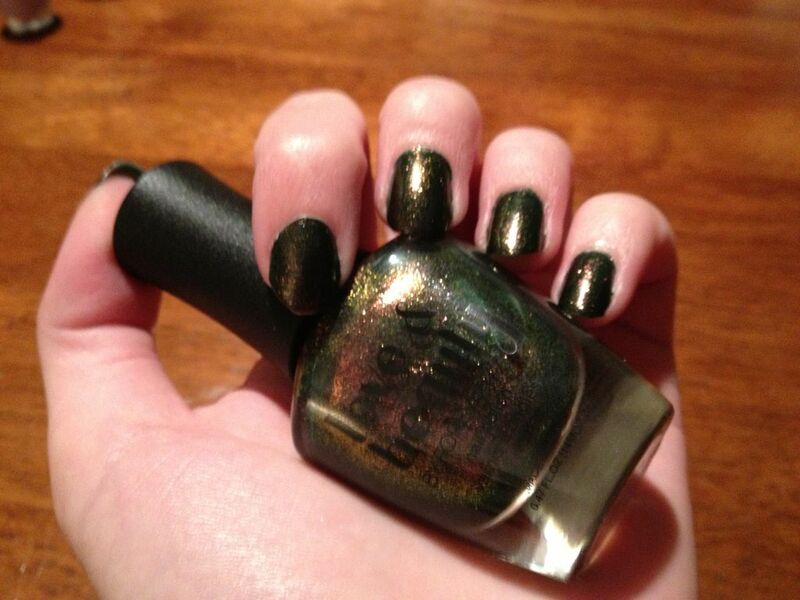 Today I have an old picture to share with you, since I didn’t get a chance to swatch any new polish shades today. Last year, I had a small obsession with water marbling nail art. 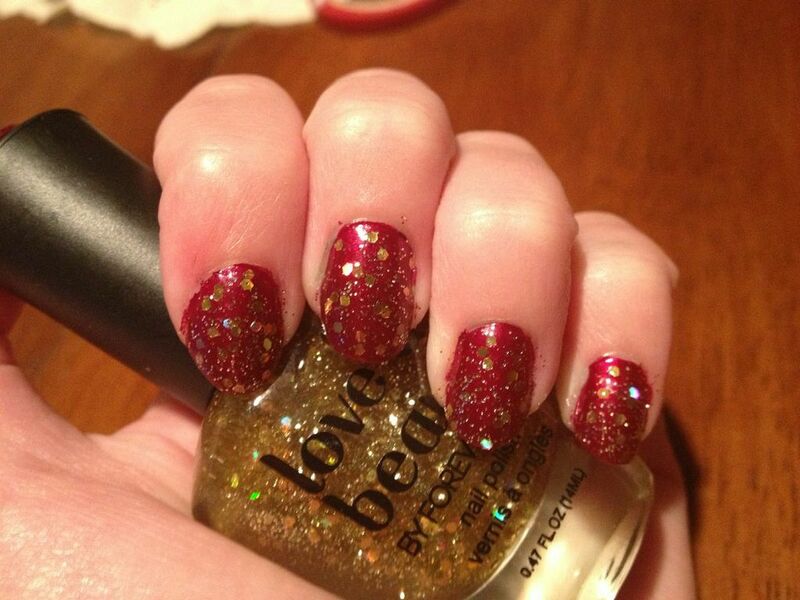 I was fascinated with it after watching youtubers (like ilovemylongnails and simplelittlepleasues, to name a few) do it so flawlessly. After mastering the technique (the water temperature is soooo important, it really needs to be very room temperature), I did all sorts of color combinations. This simple black and white one might be my favorite of them all. 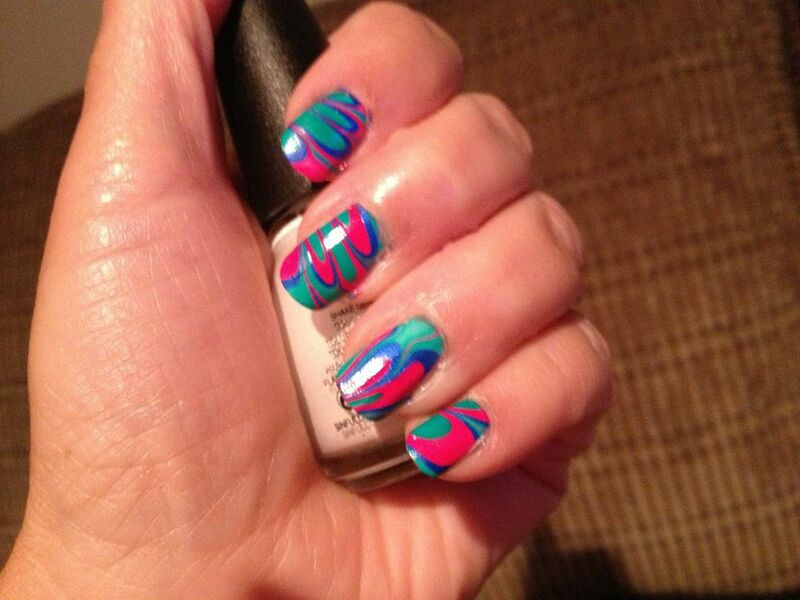 I always start with a base coat of white, to enhance the color, then used unknown black and white polishes to make the water marble “bullseye”, and draw the design with toothpicks. I taped my cuticles around the nail to prevent making a giant mess (though isn’t making a mess always inevitable?) and dipped away! Here’s a (low quality) picture of the result. 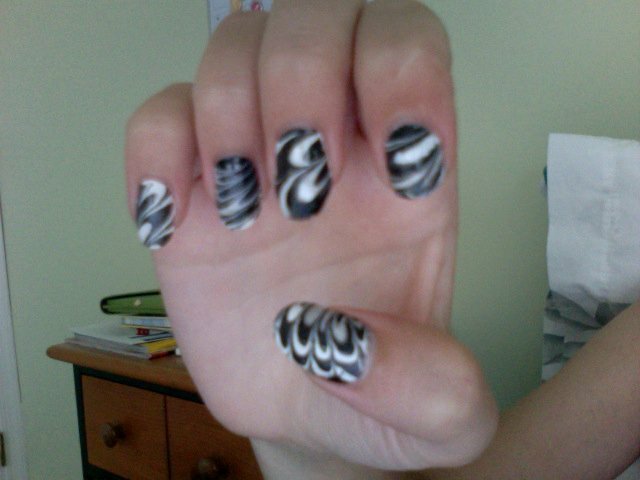 I’m super thrilled with how this old nail art turned out. 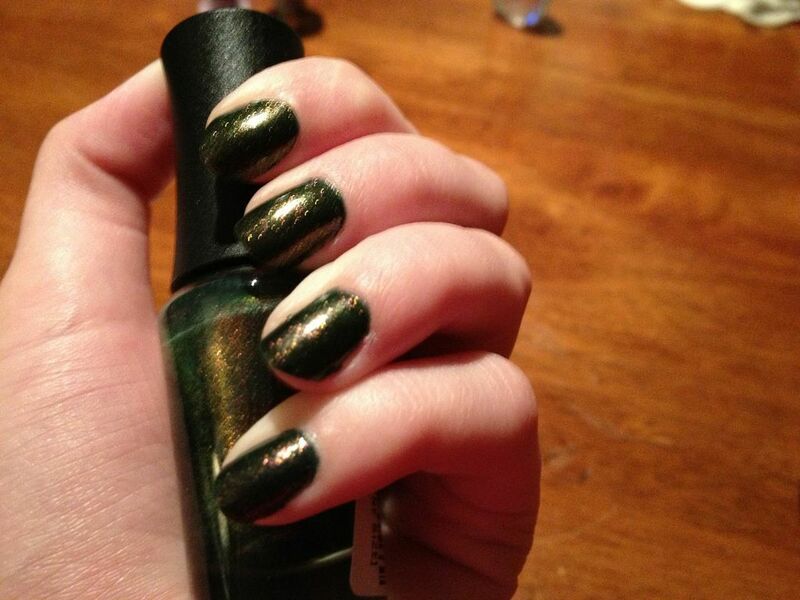 Maybe I’ll do some more in the near future with some of the fun new colors I’ve acquired as of late. What color combos would you all like to see? 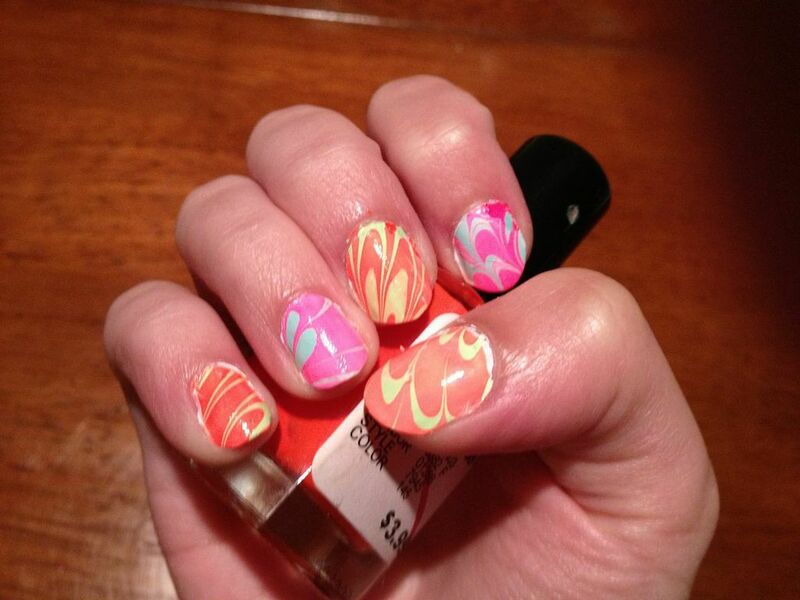 Have any of you tried water marbling? 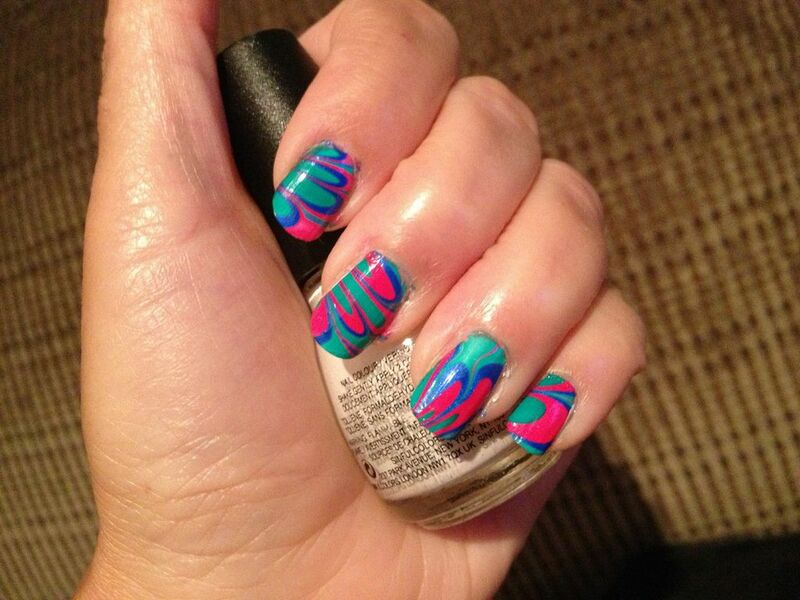 Categories: Nail Art, Throwback Thursday, Water Marble | Tags: black and white, flashback, nail art, nail polish, water marbling | Permalink.